Sunny days can lift the spirits but, can be a buzz kill on my hair, especially my ends. Just wearing it out, I fear frizz and dryness. Harmful UV Rays beating down on my locks can cause serious damage. Kerastase Paris has a solution for that with it's new Soleil Collection. The Sun collection as I like to say, shout out to my eight grade French teacher, has a line of products developed to protect your hair from daily sun damage as well pollution and humidity. Think of it as sunscreen for your hair. My favorite product in the entire line has to be Aqua- Seal. For you beauty product geeks you'll love that it has a UV filter, Vitamin B5 and Ceramide. 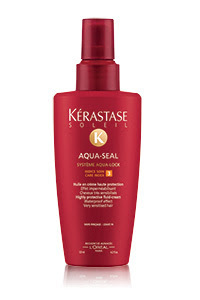 In easier terms, Aqua- Seal protects your hair from the sun, reinforces the hair shaft and provides nourishment. It's a formulated to go from cream to oil with a quick rub of your palms. It has revitalized my hair on these sticky icky dog day afternoons. It's lightweight making it great for daily use, Aqua -Seal is my new go to hair product. Kerastase has done an amazing job at fighting sun damage and protecting your hair. This is a product you most definitely need to have for the summer. Head over to the Kerastase website and make this your beauty purchase of the week.